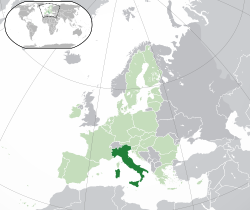 Italy is a country in south Europe and a member of the European Union. Its official name is Repubblica Italiana. The Italian flag is green, white and red. Italy is a democratic republic and is a founding member of the European Union. Its President is Sergio Mattarella and its Prime Minister is Giuseppe Conte. Italy is also a member of the G8, as it has the eighth largest Gross Domestic Product in the world. German is co-official in South Tyrol; French is co-official in the Aosta Valley; Slovene is co-official in the province of Trieste and the province of Gorizia; Ladin is co-official in South Tyrol, in Trentino and in other northern areas. Before 2002, the Italian lira. The euro is accepted in Campione d'Italia but its official currency is the Swiss franc. To call Campione d'Italia, it is necessary to use the Swiss code +41. Before 1861, it was made up of smaller kingdoms and city-states. Italy has become famous for its wine, as well as its food. Some of the most famous dishes include various types of pasta, pizza, and grapes. Olives are also incredibly common in dishes. The country's capital, Rome, is one of the most famous cities in the world, as it was the capital of the Roman Empire. Other famous cities in Italy include, Venice, Naples, Genoa, Florence, Palermo, and Milan. Italy is a peninsula, meaning it is encompassed by the sea on all of its sides apart from one side of the country (its north side). Northern Italy is separated from France, Switzerland, and Austria by the Alps, a chain of mountains. Mont Blanc (Monte Bianco in Italian or white mountain in English), the highest mountain in western Europe, belongs to this chain. The second important chain of mountains in Italy is the Apennines (Appennini in Italian), which are in central and southern Italy. The capital of Italy is Rome where the Roman Empire started.Other cities in Italy are Milan, Turin, Florence, Genoa, Naples, Palermo and Venice. The country has a number of islands, the biggest of which are Sicily and Sardinia, which can be reached by ship or aircraft. There is also a bridge that connects southern Italy with Sicily. The Po River is the longest river in Italy. It flows through 5 cities: Torino, Piacenza, Cremona Ferrara and Rovigo. The Tiber River runs through the city of Rome. Northern Italy has some of the biggest lakes in the country, such as Lake Garda, Lake Como, Lake Maggiore and Lake Iseo. Because it is surrounded by the sea, Italy has many kilometers of coast, which brings tourists from all over the world. Tourists also come to see Italy's historical places. Two very small separate countries are located within Italy. They are San Marino, which is surrounded by part of Northern Italy, and the Vatican City, which is inside Rome. People from Italy are called Italians. Even if an Italian were to leave Italy, it is possible that his or her descendants could also claim Italian citizenship due to Italian nationality law relying mostly on ius sanguinis or "right of blood" in Latin. 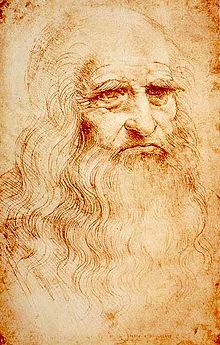 Nearly all the Italians are Christians, and most of these are Roman Catholics, which is based in the Vatican City and home to its leader, the Pope.Leonardo da Vinci is a famous artist,he is the creator of the Mona Lisa which is now in the louvre Paris. The population of Italy is a little over 60 million. About 2.7 million of them live in Rome, and 1.3 million in Milan. As of 31 December 2015, over 5 million foreigners were living in Italy, which is 8.3% of the total population. The official language of Italy is Italian and in some small areas German, Slovenian or French. People also speak languages such as Sicilian and Sardinian, which are very similar to Italian, but are different dialects of Italian. There are many different dialects spoken in Italy. They vary between regions and, in some cases, also between provinces. The people of Italy are mostly descendant from the ancient Romans. Italy is home to more World Heritage Sites than any other nation in the world. These sites are culturally important and valued according to UNESCO. About 60% of the works of art of the world are in Italy. Italy is also a big wine producer. In 2005 it made over 5 million tonnes. Italy has a modern social welfare system. The labor market enjoys relative strength, with many foreigners, especially from Romania, working in Italy where the wages are much higher. But it could have been much more workers on the labor market because men and women already retired in the age of 57 and the unemployment rate is relatively high at 8.2 percent. Italy's modern society has been built up through loans and now the country has a catastrophic high debt of €1.9trn or 120 percent of the country's total GDP. And the government can't pay back the loans during the time period the EU wish. Most people in Italy are Roman Catholics, but the Catholic Church is no longer officially the state religion. 87.8% of the people said they were Roman Catholic. Only about a third said they were active members (36.8%). There are also other Christian groups in Italy, more than 700,000 Eastern Orthodox Christians. 180,000 of them belong to the Greek Orthodox Church. 550,000 are Pentecostals and Evangelicals (0.8%). 235,685 Jehovah's Witnesses (0.4%), 30,000 Waldensians, 25,000 Seventh-day Adventists, 22,000 Mormons, 20,000 Baptists, 7,000 Lutherans, 4,000 Methodists. The country's oldest religious minority is the Jewish community. It has roughly 45,000 people. It is no longer the largest non-Christian group. About 825,000 Muslims live in Italy. Most of them immigrated. (1.4% of the total population) Only 50,000 are Italian citizens. In addition, there are 50,000 Buddhists 70,000 Sikh and 70,000 Hindus in Italy. In Venice, gondolas are a way for people to get around. During the celebration of Epiphany, it's traditional to eat a special cake called 'Rosca de Reyes' Three Kings Cake. A figure of Baby Jesus is hidden inside the cake. Whoever has the baby Jesus in their piece of cake is the 'Godparent' of Jesus for that year. Italy also has many famous foods like pasta or pizza. Italy is divided into 20 Regions (Regioni in Italian) and every Region is divided into Provinces. There are 20 Regions. 5 of them have a special status, they are called autonomous. This means that they can make certain local laws more easily. These regions are marked with an asterisk (*) below. The Head of State is Sergio Mattarella, whose task began in February 2015. Mattarella is currently the President of the Italian Republic. The first president was Enrico De Nicola. The Head of Government is Paolo Gentiloni, who became Prime Minister on December 12, 2016, succeeding Matteo Renzi. Renzi was previously the Mayor of Florence and is Italy's youngest-ever Prime Minister, at age 39 when taking office. Italy was one of the first members of the European Union and in 2002 along with 11 other European countries, it changed to using the euro as its official currency. Before this, the Italian lira had been used since 1861. Anyone who wants to be President of Italy must have Italian citizenship, be at least 50 years old, and must be able to hold political and civil rights. The Colosseum in Rome. Its original name is Flavian Amphitheatre, being built under the Flavian dynasty, an imperial Family of the Ancient Rome. Before 1861, Italy was not a state. The area was made of a group of independent states, ruled by other countries (such as Austria, France, and Spain). In the 1850s the Earl of Camillo Cavour was the Head of Government of the "State of Sardinia". He talked to the Austrians in Lombardy and Veneto and said they should create a Northern Italian state. This happened, but other Central and Southern Italian states also joined Piedmont to create a bigger state. In 1860, Giuseppe Garibaldi took control of Sicily, creating the Kingdom of Italy in 1861. Vittorio Emanuele II was made the King. But, in 1861, Latium and Veneto were still not part of Italy, because they were ruled by the Pope and Austrian Empire. Veneto was made part of Italy in 1866 after a war with Austria, and Italian soldiers won Latium in 1870. That was when they took away the Pope's power. The Pope, who was angry, said that he was a prisoner to keep Catholic people from being active in politics. That year, Italy finally came back together. Italy participated in World War I as an ally of Great Britain, France, and Russia against the Central Powers. Almost all of Italy's fighting was on the Eastern border, near Austria. After the "Caporetto defeat", Italy thought they would lose the war. But, in 1918, the Central Powers surrendered, and Italy gained the Trentino-South Tyrol, which once was owned by Austria. In 1922, a new Italian government started. It was ruled by Benito Mussolini, the leader of Fascism in Italy. He became Head of Government and dictator, calling himself "duce" - which means "leader" in Italian. He became friends with German dictator Hitler. Germany, Japan and Italy became the Axis Powers and entered World War II together in 1940 against France, Great Britain, and later the Soviet Union. During the war, Italy controlled most of the Mediterranean Sea. On July 25, 1943, Mussolini was removed by the Great Council of Fascism, and, on September 8, 1943, Badoglio said that the war as an ally of Germany was ended. Italy started fighting as an ally of France and the UK, but Italian soldiers did not know who to shoot. In Northern Italy, a movement called Resistenza started to fight against the German invaders. Mussolini tried to make another Northern Italian fascist state, the Republic of Salò, but it failed. On April 25, 1945, Italy became free. The state became a republic on June 2, 1946, and, for the first time, women were able to vote. Italian people ended the Savoia dynasty and adopted a republic government. In February 1947, Italy signed a peace treaty with the Allies losing all the colonies and some territorial areas (Istria and parts of Dalmatia). Since then Italy has joined NATO and the European Community (as a founding member), becoming one of the seven biggest industrial economies in the world. Rome-Fiumicino Airport was the sixth busiest airport in Europe in 2008. The railway network in Italy totals 16,627 kilometres (10,331 mi), the 17th longest in the world. High speed trains include ETR-class trains which travel at 300 km/h (190 mph). ↑ "The Global Religious Landscape" (PDF). Pewforum.org. Retrieved 2015-10-02. ↑ "National demographic estimate, December 2016". ISTAT. Retrieved 23 October 2017. ↑ 3.0 3.1 3.2 3.3 "World Economic Outlook Database, April 2016 – Italy". International Monetary Fund. Retrieved 2 August 2016. ↑ "Gini coefficient of equivalsed disposable income (source: SILC)". Luxembourg: Eurostat. 15 June 2017. Retrieved 24 June 2017. ↑ "European Countries". European Union. Retrieved 2009-07-24. ↑ "Alps are the border between Italy and other countries". ↑ "Four missing in Alps avalanche". BBC News. 20 April 2002. Retrieved 23 July 2009. ↑ "Biggest Islands in the World". ↑ 11.0 11.1 11.2 "Italy: Encarta". MSN. Retrieved 2009-07-24. ↑ Zwingle, Eria. "National Geographic". National Geographic. Retrieved 2009-07-20. ↑ Watson, Philip (19 March 2005). "The lake show". The Guardian. Retrieved 23 July 2009. ↑ "Tourism damaging Med's wetlands". BBC News. 15 July 2004. Retrieved 23 July 2009. ↑ "Alarm sounded over Italy's treasures". BBC News. 20 November 2002. Retrieved 23 July 2009. ↑ "Citizenship by descent". conssanfrancisco.esteri.it. Retrieved 2018-08-19. ↑ "Italy". Central Intelligence Agency. Retrieved 2009-07-25. ↑ "Flag Counter: Italy". Retrieved 2009-07-11. ↑ "National demographic balance, 2015". www.istat.it. Italian Government. 16 June 2016. Retrieved 6 September 2016. ↑ "List of UNESCO World Heritage Sites". UNESCO. Retrieved 2009-07-24. ↑ "Countries by wine Production". ↑ "Report for Selected Countries and Subjects". www.imf.org. ↑ "Rome burns its Euroland bridges". Mail Online. 8 November 2011. ↑ (Italian) "Italy: 88% of Italians declare themselves Catholic". Corriere della Sera. 2006-01-18. Retrieved 2009-05-10. ↑ "The Holy Orthodox Archdiocese of Italy and Malta". ↑ "World Council of Churches". ↑ "UK Foreign and Commonwealth Office". ↑ (Italian) Italian Buddhist Institute "Soka Gakkai"
The Simple English Wiktionary has a definition for: Italy. Wikimedia Commons has media related to Italy.